Jenolan Caves is typical of what is known as a karst landscape. This is a landscape where the dominant means by which it is shaped is through the action of water dissolving the surrounding rock. Dissolution of rock is not the only means by which the landscape is shaped though, as mechanical wear induced by gravels and other abrasive substances can also play a significant role. Presented below is a sample of some of the landforms to be found at Jenolan. When the roof of a cave comes close to the surface weaknesses can lead to collapse. When this happens a doline is formed. 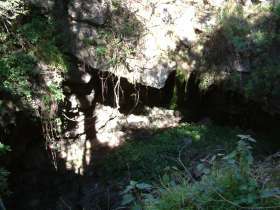 the photo shows the doline above the Elder Cave which is approximately 20 metres across and 10 metres deep. The top half of the photo shows a cliff edge which opens out into the remains of a cave chamber. In the lower half is a rockpile which comprises what was originally the roof. This is similar in formation to the doline above except that the sides have been significantly smoothed through the inflow of soil. 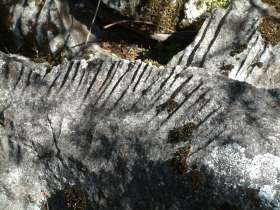 This doline may also have been formed through the gentle subsidence of the underlying rock so that instead of a substantial collapse, the surface simply subsides. Note how this doline looks like a shallow saucer sunk into the landscape. During floods this particular doline fills with muddy coloured water, indicating the connection with underground river isn't direct. 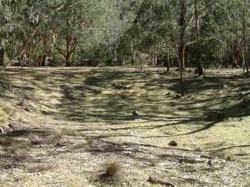 Other dolines at Jenolan at river level fill with blur water which indicates during floods the river rises and fills the doline. Normally a valley will open out into another valley or onto a plain. In a karst landscape it is possible for a valley to be closed at the downstream end. The stream has been able to create a subterranean passage enabling it to go beneath a ridge. In this photo it is quite clear how the water has avoided cutting over the ridge. It has created a large cave which is called the Devils Coachhouse. Note that the creek is not normally seen flowing through the Devils Coachhouse as it has been able to create a cave for itself at a lower level. It will only be seen flowing through the Devils Coachhouse during periods of flood. The photo shows the Carlotta Arch. Whilst freestanding arches like this are not common, they are not entirely unexpected. An arch such as this is the remnant of an old cave. A stream once flowed across this part of the landscape creating this cave. The surface of the rock has then been gradually worn away and as it has done so, the cave has gradually collapsed and the rock around it has disappeared. In time most of the cave vanishes leaving only a brief section of it. What is seen is therefore a cross-section from partway along the cave. With time this rock too will be worn away and when this happens the arch will finally collapse. Whilst it probably doesn't have to be mentioned, the landform that Jenolan is best known for are caves. A cave entrance can be large or it may appear as nothing more than a gap between some boulders. Caves form both from water dissolving rock as well as collapse of rocks that have been weakened. Running streams may also introduce gravels and sand which have an abrasive action, contributing to the growth of the cave.